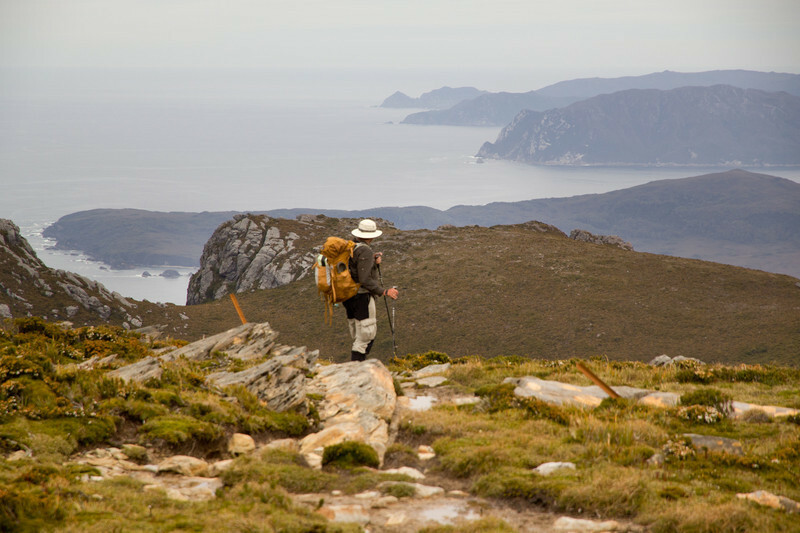 Sometimes we come across fantastic trip reports and this one about the South Coast Track in Tasmania is a winner. Maintained by “The Sons of the Desert”, this site is interesting, quirky, well written and contains some really great information. We suspect very clever people , who can actually write and photograph, are behind it. With “the Son’s” permission we have linked to a couple of their excellent images and stolen some amusing and enlightening pieces of text. Please read the full trip report, it is well worth your time if you are planning the South Coast Track or just want to see why you might never go there….or, just live the adventure vicariously. But as we descended the south-easterns side of the mountains two things happened. The first was that the flora went from alpine to rainforest! A complete, dramatic change which contributed to making the thousand metre descent quite challenging. The other thing was that the well made track ended; that was the last of well made tracks until the final day. So what we were left with was descending what was alternately a muddy trench or a root filled running watercourse down a thousand metre descent all overgrown with rainforest undergrowth. The horizontal distance was about 2k; it took almost five hours. We then walked on to our intended campsite at Prion East. 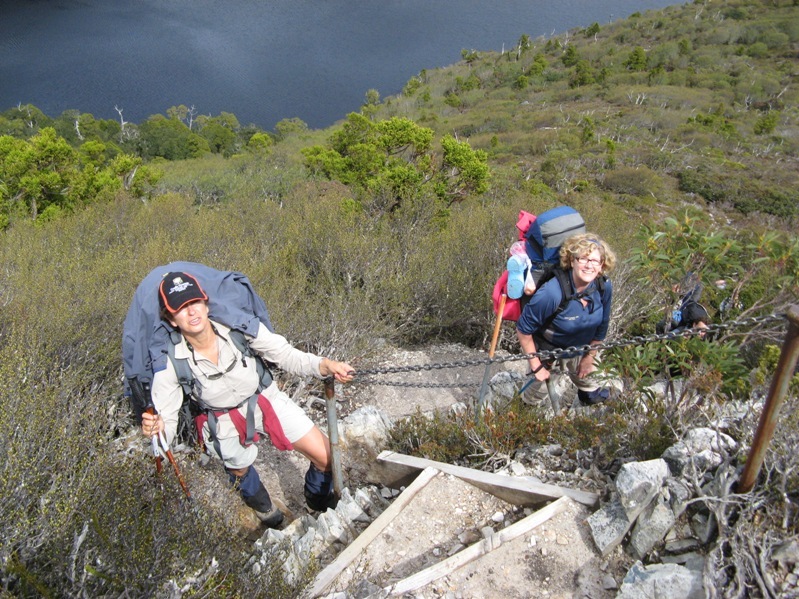 When we had almost achieved it we found that (not for the first or last time) storms had destroyed the track work, and there was a twenty metre almost vertical sand and slippery rock climb to get to the campsite. When we got the campsite, we found that there was no water: the only water was in soaks at the bottom of the climb! The people who came in the other direction arriving at Granite Beach camp were shellshocked. It started with a relatively tolerable 600m climb through moderate mud and up waterfalls laughingly called track. But when we got to the top, there was a traverse across the ridge line for a few km that was extraordinary. Many people were getting in the mud up to their waists. I managed my thighs but no higher. Interesting how psychology changes: at the cold moment I would have paid thousands to be transported back to civilisation. Warm in my sleeping bag I would have paid a lot *not* to be transported out and miss out on completing the walk! Cold is bad, warm gear is great! We hope you enjoyed the article over at The Sons of the Desert site. Many thanks to them for granting permission to share the information here. 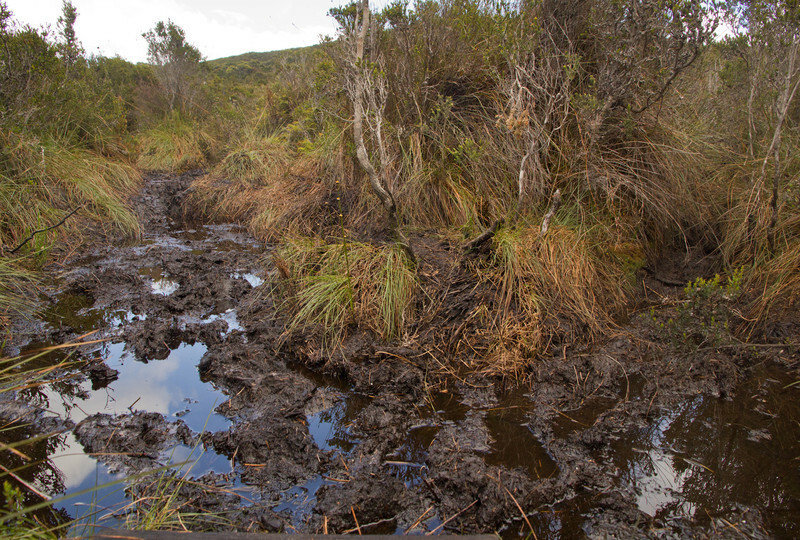 Have you hiked in mud or water like this? Shoot us your thoughts and experiences below, we love to share. Hi Frank ( and others ) Thanks for this article . Very useful as I have been pondering about a trip to do this walk but in Winter of this year. Do you know of any info re the winter side of this trip as most info to date indicates not to do at this time .Do you know of any info about re the winter aspects of this walk . I have 6/12 off from March this year and am planning on some wondering down south and about . We don’t know of anything specifically about doing the SCT in Winter. Obviously the chance of rough weather is high and the mud will be deeper or surrounded by more water. The river crossings will be more of an issue , most of them are roped from memory BUT great care and extra time in case you need to wait for the levels to drop would be strongly advised. Others here might have a better idea but it is doable, especially if you are patient and kitted out well. LOVE the Louisa Bay photo! Man, I really need to get down to Tassie! I just completed the South Coast Track, took us 9 days in late May. The track is amazing, but this time of year the weather can make it quite dangerous and difficult. Many of the rive crossings were chest height on me, with a few over my head. (Though I am 162 cm) . The mud was waist deep in sections, and knee deep in alot more sections! To do this trip in winter you would want to be an experinced alpine walker! Excellent Hannah, sounds scary. It is a tough trip with lots of river crossings and mud. Sound like you made it out so congratulations! 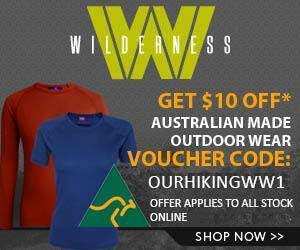 You could email us here or drop them on our FB page – http://www.facebook.com/OurHikingBlog – would love to check them out.